We decided a few years ago that we wouldn't buy toys for Christmas and birthdays any more. It had always been a goal and we weaned off the purchased gifts slowly, going down to one simple gift per child for birthdays and doing Kris Kringle for Christmas. I want to emphasis how exceedingly well this fits the bill wherever gifts are needed. Not only is it a money saver but it also gets the creative juices flowing, leaves the creator feeling satisfied and the receiver feeling loved. Over the years the kids have really come a long way on this... The fun in gift getting now comes from finally being able to see the cause for all the strange noises coming from the workshop or sewing room. Here are some pictures of some simple gifts we've made over the years! These are a fairly new invention... the kids call them 'knittles' after their series of 'woodles'. Theresa and I have had as much fun making them as the kids have playing with them. They're small (only about 3in.) so they work up really fast and it's fun creating the different characters. Here we have my 'mini marvels' series of super heros and villians that the kids requested and Theresa's Incredibles set (as you can see, Violet (middle) isn't completed yet). Here's the kids harried mess of 'woodles'. This is an ongoing collection of people from various movies and books that the kids get into. They either implore an older sibling to draw the character or they find a picture online or in a book to copy. 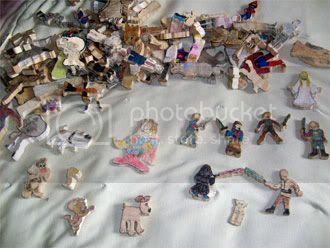 Then they trace them onto wood, have an older sibling cut them out on the scroll saw and then color them with different things. Here we have some Lord of the Rings, Star Wars, Garfield, Wallace & Gromit, Indiana Jones and plenty of etc. 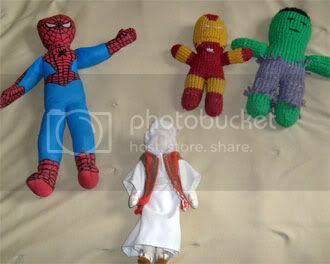 Here are some super-hero dolls we girls have made for our brothers for birthdays or Christmas. Spider-man is the biggest and I made him following a simple pattern that I've had forever. The webbing is fabric paint squirted on which worked really well because it's raised (like the real one) and went really fast. His eyes also glow in the dark. 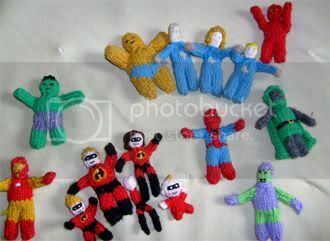 Iron Man and Hulk were knitted by Annie and I. I originally used the pattern to make a doll for Donna but the boys immediately wanted action figures so when their birthdays rolled around... Oh, and the last one is Stephen's favorite super hero (rolling eyes), himself! LOL. As kind of a gag gift I made him a Moses plush toy from the movie we made (where he played Moses). He says he's really good at doing the voice for the doll. Here's a nice easy one for a boy to make: a rubber band gun. I bet any boy would admit that there's little else that's as fun as shooting their sisters with a rubber band. Michael made this one for Johnny's last birthday. He made it so fast that he had time to put together the target to go with it before his birthday party. 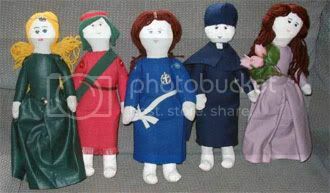 Here's a bunch of dolls that the girls and I made for an All Saints' Day party. They're all different Saints. They were made from a downsized version of the same (heavily used) pattern that the Spider-Man doll was made from. I love that pattern, it's so easy! Let's see, here we have the saints Barbara, Paul, Genevieve, John Bosco and Rose of Lima. Here are some dangerous weapons that any boy is sure to love. The light saber was made on the lathe and, as you can see, you can choose to be either good or evil by the color of blade you choose to stick in the handle. 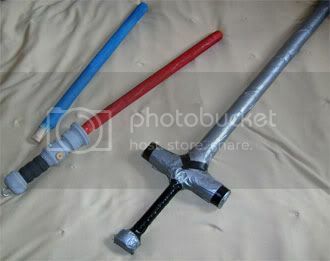 The sword is PVC piping wrapped with foam and duck tape (black electrical tape makes the fancy handle). The foam inside allows them to whack their brothers and have an excuse ready for Mom. 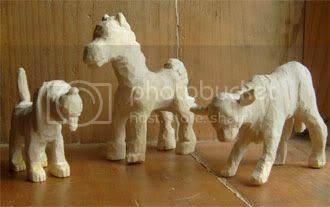 Here's another new series coming out, "whittles." 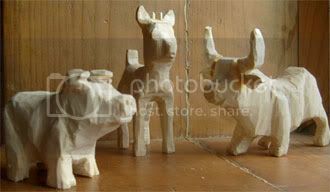 They're actual 3D animals that the kids have been whittling. The new whittling hobby has been taking over the living room with its constant shedding of wood chips. 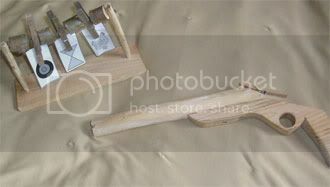 Johnny and Lizzy have been practicing their whittling on soap for now. Right now, they're trying to get some map tacks for the eyes and decide whether or not to paint any of their animals. 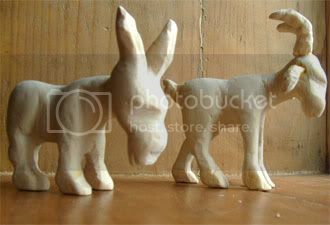 Here's Stephen's donkey and goat. (They need eyes and shellac varnish yet). Theresa's dog, pony and calf. Her attention to detail amazes me sometimes. Here's Michael's pig, fawn and bull. Check out the horns on that big guy! 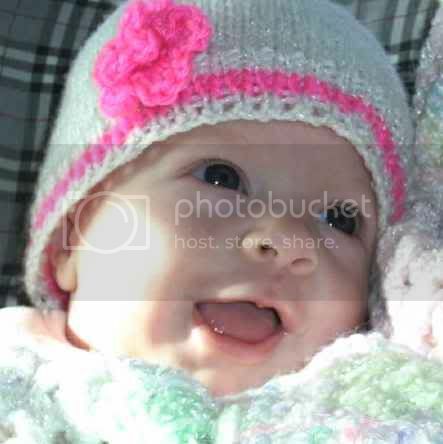 Here's a big project that we did as a family for Theresa years ago. 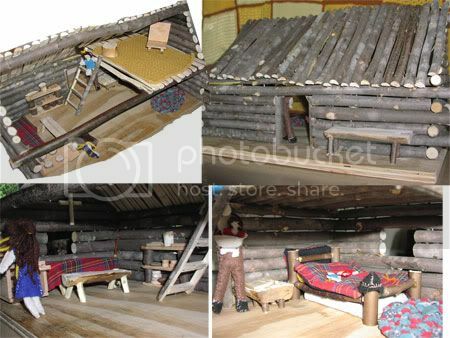 It's a cabin doll house complete with furniture and people. 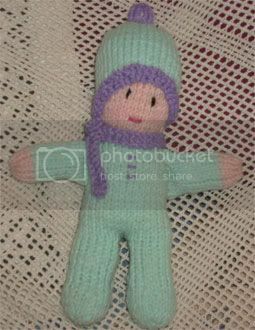 And the doll that Mom made: Okay, I'll admit that she did a little better job than me. Yeah, she's a keeper. Aside from the toys mentioned above, not being near the exposure of a big city has driven us to make a lot of the normal entertainment devices on our own, such as movies, (okay, so they're not full length feature films, but they're still fun to create! ), books (Annie's written two series now that the kids have positively devoured, I guess she knows their tastes! ), comic strips (the boys are all good at cartooning and have been talking about doing a daily), coloring books (everyone--but me, LOL!--can draw really well - Annie had been drawing coloring books on the lives of the Saints to accompany my Saint dolls), and board games, (the boys have created and designed at least two board games now, with tons of little pieces like tanks, trees, brigdes and turrits). It's hard to remember all the things we've made. We usually go through phases where we get into different things, like stilts, for example, and everybody has to make their own set of stilts and compete at both making the best pair and being the best stilt walker in the family (of all the useless achievments! LOL!). There are some more pictures of homemade gifts on my 'share in our Christmas' post back in the archives, if you're interested. Anyway, hope this post inspired the creative juices in you or your children. Wow! You are all so talented. The toys look great! You've given me some great ideas to use for toys for my siblings and little cousins. I think I will try one of the dolls for them. Hope you have great day! "Neat-o" (okay, now I that I have given my slang word for the day), those look really great. We almost always make home-made gifts for Christmas (We were slackers for the last three years, but that is because we always manage to move at Christmas time). BRILLIANT!!!! Have a great week!